All possibility and potential exists in changing the way we think. With all that we have learned about neuroplasticity, embodied cognition and our patterned biosphere we are ready to learn more. 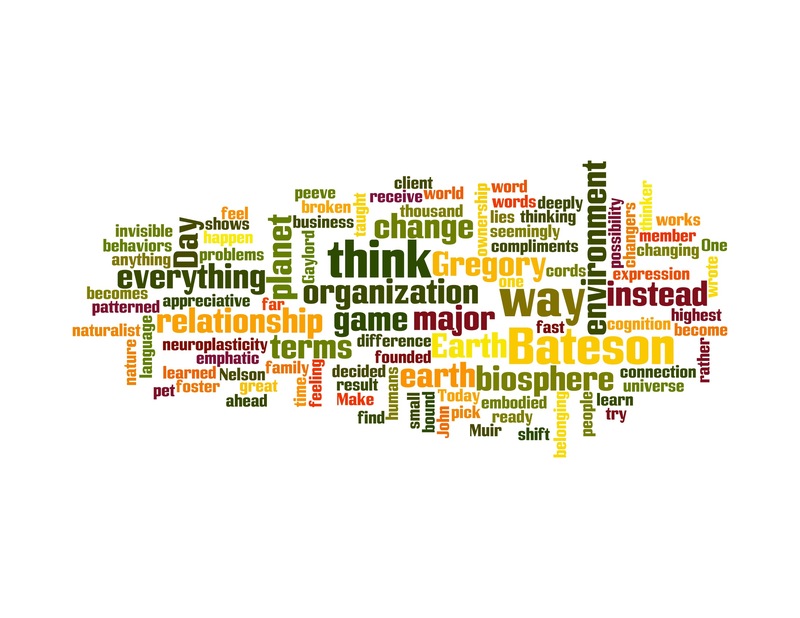 Gregory Bateson, thinker ahead of his time and author of “Mind and Nature – A Necessary Unity” was emphatic that everything be taught in terms of relationship. Do you have a pet peeve? I do. It is this word: “the”. One of the highest compliments an organization, community or business can receive from a client or member is an expression of ownership and belonging. This connection shows up in our language. When “the” becomes “our” or “my”, there is connection, community, creativity and commitment. These seemingly small words are major game changers and level ups that shift our thinking, feelings and behaviors. 1. Decide to speak, think and feel in terms of “our environment” instead of “the environment”; “our planet” instead of “the planet”; and, “our earth” rather than “the earth”? Would this change foster a more deeply appreciative and active relationship between humans and our biosphere? The results may surprise us. Let’s make this word change an ongoing Earth Day game for ourselves, our families, and organizations. The win will be the benefits of better choices that come to us naturally. We are healing ourselves and our world by changing the way we think…word by word. Watch this trailer for the new Gregory Bateson documentary.